Typical northern norwegian landscape at the Vesteralen Islands; but the star of the photo is a very ephemeral phenomenon, the fog that formed above the tarn for a few minutes at dusk. Let’s start in the world of hermeneutics and try to trace the meaning or meanings of the word “essence”. The Oxford dictionary offers three different explanations of the term. Firstly, essence means the intrinsic nature or indispensable quality of something, especially something abstract, which determines its character. The second explanation is rooted in classic philosophy and frames essence as a property or group of properties of something without which it would not exist or be what it is. Last but not least, essence is also understood as an extract or concentrate obtained from a plant or other matter and used for flavoring or scent. All three definitions hint at some aspects that are important when putting the word – and all its connotations – into the context of natural environments and landscape photography. For example, the notion of intrinsic nature or indispensable quality makes it appear obvious that the material world around us is full of these “somethings” which may lend themselves to form the essence of a landscape. Intrinsic implies that a property or a feature has not been introduced, attributed, or associated with the things in question. Natural landscapes are perfect examples of this. Secondly, the expression “determining its character” suggests a property or feature that is formative and essential to the landscape itself. The term “characteristic” is very common for describing the features of natural places, making the essence of such places easily locatable. Thirdly, the statement that essence may derive from one property or a group of properties makes a great deal of sense for landscape photographers who are most concerned with focusing on a singular aspect of a natural scene or with carefully composing several aspects or elements into a well-crafted photo. And last but not least, the analogy to flavors or scents is a very fruitful one, since distilling something special from a moment in time and space is very much like reducing and extracting the scent of lavender blossoms into a single drop of oil. A small granite rock at Skagsanden beach is the focal point of a rather abstract photograph. If you followed me until this point, you may feel as uncertain as I do about how the meanings of essence are actually connected to the act of photographing landscapes. Many questions came to my mind as I enjoyed Sandra's LYS presentation and allowed the thoughts to evolve freely. Is the most distinctive or the most common natural feature of a place considered its essence? Is essence an absolute concept or does the determination of the character of a thing require its comparison to other things? Is the essence of a place the same as the essence of a whole region or even sub-continent? Is the essence of a natural environment objective or is it a subjective construction, a personal view? And how does this translate into photographic techniques or methods such as long exposures, high key, exclusion of the sky, and macro photography with shallow depth of field? I will try to shed some light on these questions using photographs as examples in the following sections of this article. As previously pointed out, the term “essential” can mean characteristic or indispensable. These two words seem to mean the same thing, but can vary wildly in interpretation. The implications for photography that seeks to portray the essence of a landscape are huge. The term “indispensable” means that a feature is of such vital importance that without it the thing would not exist or be what it is. The most obvious interpretation of this is that the essential feature is the most prevalent; without such a feature there would barely be anything left. Thinking of essence in this direction leads to looking for the feature of a landscape that dominates its most common appearance. Scandinavia, for instance, boasts vast forests that look virtually identical for hundreds of kilometers in every direction. It boasts tundra on the “Fjells” of the Skanden Mountains and in the high north; tens of thousands of rocky islands in the archipelagos of the Swedish or Finnish coasts; tens of thousands of visually exchangeable calm lakes within the forest. These natural features cover much more of the lands than the dramatic mountains of Lofoten or the famous Fjords in Western Norway. It is thus rather safe to assume that these topographies and ecosystems are much more typical for Scandinavia than what is commonly associated with this region. On the other hand, to interpret the essential rather in the sense of the characteristic may be to navigate a quest for the essence of Scandinavia to its unique, outstanding landmarks. It is absolutely legitimate to argue that a landscape – as much as a person or a city – is much more defined by the features that make it individual. To strengthen this point one might force oneself into a thought experiment: Think of the Red Centre in Australia, a one million square kilometer desert with red sand, gravel and small patches of Triodia grass as far as the eye can see. Somewhere, right in the middle of this place, are several sand stone monoliths, the most famous being “Uluru”. Thinking in quantities, this rock – as massive as it is – is nothing more than a needle in a haystack. Yet, it makes this desert unique simply by adding a single small but incredibly characteristic feature. Without it, the Red Centre would just be another desert. With it, it is a Mekka, a Walhalla. 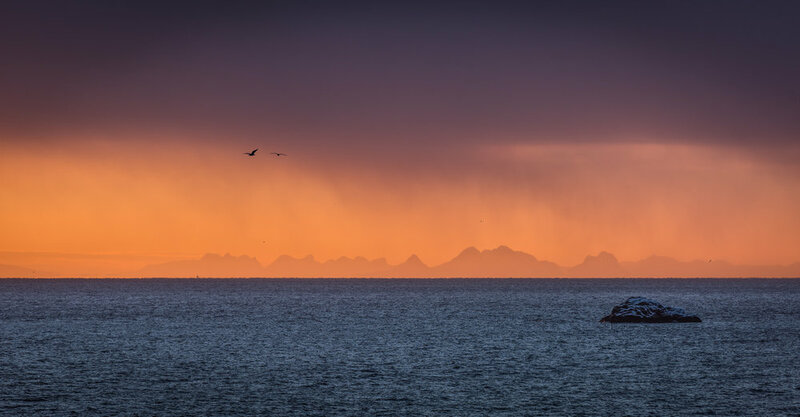 At first glance this might be the most typical Image of northern norwegian landscapes: high fjells, towering granite peaks high above the ocean and wide wild views. Both ways of conceptualizing essence are completely valid. The differences may be found in two more questions: Is “essence” an absolute or a relative concept? And, is the essence of a landscape something that simply exists – in the sense of existentialism – or something that is constructed by humans and their personal and shared views on the landscape? The “uniqueness” strand of interpretation supports the relative and subjective concept: In order for something to be considered unique, it must be compared to other things. If Scandinavia is seen as “essentially fjords with some hinterland,” then this reveals that much more importance is put on what separates this region from the boreal forests of northern Russia than on what is the most common topography and vegetation, which would be boreal forest just like in Russia. And it reveals that essence is in the end a human-centered construction. To associate the features of a landscape with different “levels of importance” is a habit of man. It's us who permanently compare, who embark on journeys to places that are unlike the environments we pass through every day. It's us who engage in discourse about places and who shape perceptions by producing and consuming billions of photos that showcase only a fraction of the whole landscape. This is the quintessence – pun intended – of shooting icons, the default mode of the majority of landscape photographers since the beginning of the art. With “LYS”, Sandra and her partner for this project, Werner Bollmann, made the decision to boldly go for the less-trodden path and search for essence in the beautiful monotony of the endless forests and tundra, in the snow as far as the eye can see in Svalbard, and in the repetitive patterns and shapes of islands in the Baltic Sea. This alone is worth a great deal of praise since it delivers a fresh and seldom seen look at the places and reasons for a rethinking of the ways we perceive and photograph the natural world. Land and light: What defines a place? Closely connected to the thoughts about where to find the essential features of a landscape, is the questions of where to point your camera once you are at a location. I’ll come to two important questions concerning scales and abstraction in later sections; here I want to discuss the dichotomy of land and light and its relevance for the quest for essence. The moments landscape photographers live for: spectacular scenery and breathtaking light. Here attributes typical to the landscape in the region go hand in hand with light not specific to the place. In August 2016 I was shooting in the Lofoten backcountry. I considered myself lucky as the dramatic mountains were illuminated by a spectacular display of light and weather. A storm was clearing and big, dark clouds dominating the sky. It was an hour before sunset and small patches of sunlight managed to hit the land. These moments of change yielded a colorful and bold sky, a sunbathed foreground and – as the icing on the cake – a rainbow. It was a sight to behold, but did I manage to capture the essence of this place? Let me stick with the rainbow. I have shot rainbows in Germany, Italy, South Africa, Ireland and Norway. They almost look the same everywhere. Only the spatial context differs. Or, to put it more vividly: There is almost nothing space-specific about rainbows. There might be regions on earth where there are more probable than others, but a rainbow is nowhere near typical or characteristic for any single place on earth. 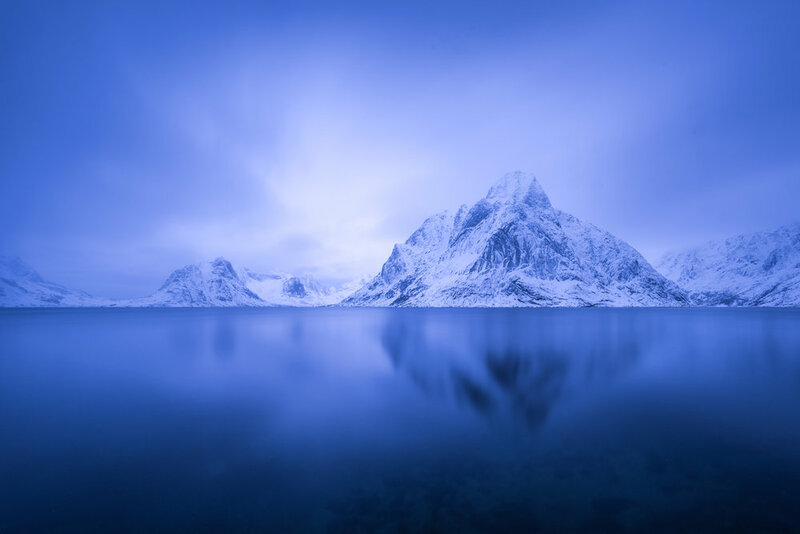 The same is very much true for the light of the blue hour, you might encounter it more pronounced (and for a longer time) in higher latitudes, but there is no way to link this light a specific place. And not to speak of a colorful sunset, which has absolutely nothing to do with the essence of a place. If someone claims this to be the fact, it would be a shameless lie and promotion of post-card clichés. But, and there is a valid but, there are some situations where a certain light or weather conditions may be incorporated in the construction of essence. The criteria are that the phenomenon occurs often or regularly and (not or, and!) is limited to one or a few places on earth. Under these circumstances what happens in the sky can be considered typical, characteristic and maybe even indispensable, although I would not take it that far. Possible examples for this may be the monsoon storms in the US southwest which often create virga clouds that have become a trademark for this region or the occurrence of the northern lights in Canada, Greenland, Iceland or Norway. Looking back to a photo that I created in Artic Norway in the winter of 2015 (and named “The quintessential sunrise” without anticipating that it would play a part in an article about essence in the future), even the typical hour-long low angle winter light above the Arctic Circle may qualify for that. The definition of essential light has very fuzzy edges and if one were on a mission to portray the essence of a place, it would be advisable to be extra careful and thoughtful about the light. This is the photograph that I named “The quintessential sunrise”. But to which degree a photography focused on the light can capture the essence of a place? And if I were to mention that what I said about the light in the sky may very well be applied to the colors of the leaves of deciduous trees, one would get the idea that bringing together unchanging and ephemeral elements in a photograph is like walking the line between the usual and the unusual, between the normal and the unique, between the truthful and the cliché. I've been using spatial terms like “place”, “region” or “environment” throughout this article without explicitly pointing the way in which the aspect of scale is greatly significant for the topic. Let me explain why I believe it is vital to think about scale: Firstly, one must realize the proportion of the spatial unit that one wants to capture the essence of. And secondly, the choice is whether to capture it in a wide-angle-view or by selecting smaller parts – fragments, ingredients – to actively direct the viewer’s attention to what one believe is most characteristic about the place. The first question is actually very difficult because there are so many possible answers. The larger the spatial unit becomes, the more challenging it becomes to distill the defining features out of it because a broad contemplation about the essence has to materialize on smaller scale within the reach of something you can actually photograph. So, finding the most common or typical features of a region, a country, a group of countries or even a continent is a daunting task that will result in emphasizing some features and leaving out others. Sandra Bartocha and Werner Bollmann did choose one of these daunting tasks and started the search for the essence of Scandinavia (which included four countries in their reading). The inevitable answer to this challenge was a series of photographs, or even more precisely a collection of six series of photographs. Each series concentrates on an ecosystem (tundra, forests etc.) that they consider essential to the sub-continent. This is the only serious way to achieve it with a place this large, but if one seeks to capture the essence of Svalbard, the essence of Milford Sound, or even the essence of the small patch of virgin beech forest at your backdoor, one might be able to do it with a small series of photos or even with a single photograph. No matter how small the place becomes, composing all the essential features into one frame and shooting it at a single moment in time remains the ultimate challenge. The four most prevalent components of the subarctic landscape of northern Norway: granite, ice, moss and grass. Dissecting an ecosystem on a small scale level may appear a rather scientific approach, but the result may be a very aesthetic and meaningful photograph. The second question is a more practical one, although I want to introduce it with yet another metaphor. When a perfumer creates a new scent, he uses essential oils obtained from a plant or something else. The production of this essential oil means the decomposition of the original scent-carrier. The blossom may be dried, solved, chopped, cooked or processed in another way to extract the concentrated essence. With these processes with photography in mind, it’s intriguing to think of how applicable the approach of decomposition is. Does the essence reveal itself when you sort the natural ingredients? Do you need to go into the macro world? Or is this metaphor misleading? A little bit of both. Extracting a special feature, like the scent of the lavender blossom, is just one way to deal with essence. Lavender has many other characteristics, like the color or the blossoms, the way the plants grow, the arrangement of the plantations and even the wider realm of the ecosystem they live in. So if you are not a perfumer but a nature photographer, you do not need to decompose your subject by all means. You may concentrate on other features or try to combine the portrait of several dimensions in one photograph. The same is true for landscapes. It is completely justified to choose a viewing angle equal to a human perspective and overlooking the land. This way several typical elements can be arranged in the photo and the view is recognizable so that the viewers can relate to it. Looking down between your hiking boots will reveal the natural ingredients of a place. In the case of the Lofoten Mountains near Svolvaer this is moss, ferns and little shrubs. Having said that, I mean to make a strong argument to not only stick to this approach and create photos that play with scales in order to portray certain characteristics. One way to do so would be to employ ultra-wide angle lenses to emphasize the vastness of a place. If there is a single dead tree in a plain, a wide angle might show more of what this place feels like than a telephoto portrait of the tree. The other direction is even more valuable because it is connected with the argument that I made earlier: exclude the sky, point your camera down, lay flat and enter a unique perspective. This perspective enables you to decompose and re-compose the material world around you and confront the viewer with what sums up a place. A place is almost always composed of smaller fragments that repeat and repeat to fill the space, may this be with lines in the sand, lichens and mosses that cover every granite boulder until the horizon or drops of dew on the bark of an indigenous tree that provide a window into the world of a rainforest. Here we close another circle because these intimate views play a perfect role in a series of photos that – together – allow you to look deep into the soul and fabric of a place. And, another circle, it’s a way to get your individuality and subjectivity to become a vital part of the project. At the end of the section about the ephemeral nature of light I introduced the term “truthful” into this article. Given all the previous considerations and thoughts, it can be concluded that seeking to portray the essence of a landscape is in the end a process of documentation, of counting and balancing, of science rather than art. To some point, this is true. There is no natural connection between essence and beauty, the latter being the most common goal for landscape photographers. But while it may be justified to focus on the monotony of vast expanses of pine forest and to avoid unusual light in order to come closest to what is characteristic or indispensable, the process of the creation a photo is still a creative one and the constraints, which a mission like “capturing the essence” imposes, leave enough headroom for artistic choices. Essence and beauty have no causal connection, but they are also not contradictory. Finding beauty in the essential – does that sound like a challenge you’re up to? Then you are ready for my final thoughts. A long exposure at night reveals the most characteristic features of the beach of Vik, Lofoten, because ephemeral elements like the surf are mitigated. For the final section of this article I want to come back to a notion from the Oxford definition that directly points towards specific photographic approaches and techniques. The dictionary states that essence means the intrinsic nature or indispensable quality of something, especially something abstract, which determines its character. As photographers we should be especially interested in the part that says “especially something abstract” as it provides us with a legitimate way to employ artistic techniques like long exposures or highly selective compositions in order to portray the essence of a landscape. Throughout the article I have hinted at argumentations that connect the concept of essence with subjectivity and artistic expression; thus, here is a small tool kit of what every photographer can do. This was only a small part of the repertoire that a landscape photographer can use after making his or her thoughts about the scene. There are dozens of others, from multiple exposures to further abstractions to a scene to panoramic photos to further widen the scope of the shot. If you’re in this position you may employ this or that technique – or anything else that feels right for you after thinking about capturing the essence of a landscape! And last but not least, don’t get too obsessed about the concept of essence when composing a scene – it is just one concept that directs your way and by definition not more meaningful than other concepts. Purposeful compositions: I have mentioned quite a few examples for the potential that lies in purposeful compositions in order to capture the essence of a landscape. There are, however, absolutely no dos and no don'ts in this. Re-consider what I wrote in the section about scale and make a point to think explicitly not only about thirds and s-curves when you compose a photo, but also about what is expressed by selecting certain elements of the landscape and by excluding others. Think about how big visual elements are and how you can use empty space to emphasize the singularity of elements. Think not only of what composes certain elements in the most beautiful way, but also in a way that represents them in a characteristic manner. Long exposures: The wonderful thing about long exposures is that they do offer a neat way of simplifying an image and thereby enhancing particular parts of the subject. They also allow the photographer to visualize temporality and motion, which may be a small but integral part of what one considers the essence of a place to be. An integral part might be the power of the surf that relentlessly hits a shoreline. It is almost always there and to visualize the motion in a way that transports the sound and the power of the waves it to come closer to capturing the essence of that stretch of coast. A perfectly still frame may or may not achieve this. In this case exposing for a longer period of time than what delivers tack sharp water droplets brings the movement of the waves into the image. The very same approach can be used for other settings, for example ever moving aspen foliage or snowflakes. The key is to think of what sums up not only the static components of the place, but also the changing. The approach I mentioned first is a classic technique in intimate landscape photography. Exposing for a long period of time, minutes rather than seconds, makes every movement disappear. I employed this approach in my photo titled “Three”: It was taken on an early, very calm winter morning in Reine. The sky was overcast and the snow muted every sound. I sat at the pier for half an hour and enjoyed the silence, which was so much part of the scene that I decided to visualize this impression of congested time. I put on a six-stop ND filter and exposed for three minutes which completely eliminated all signs of motion in the water and created a dreamy and calm atmosphere. It is a single image that, for me, transports a fragment of the essence of winter in the far north. When it takes a long time … it might take you closer to the essence of a place. A three-minute exposure of the Reinefjord creates a reduced synthesis of light, place, silence, and time. Blur: I hope you notice that selection is a key method that translates the analytic process of perceiving and deciding what makes up a place into the photographic process of building a scene. The selection can be done via composition, but there are other methods as well. Choosing a wide aperture allows you to create a narrow slice of focus, especially with longer lenses or in macro photography. By this means, the attention of the viewer is strongly steered in a certain direction, even to the degree that all but a single element of the scene is no longer identifiable because it is out of focus. This is a very common approach with macro photography, but it derives mainly from artistic considerations. So you should consider carefully whether you are actually coming closer to showing the essence of a place when you shoot this way – or whether you only make chaos look beautiful, when chaos is actually the perfect way to describe a place. With this in mind, a photo showcasing a shallow depth of field is almost never a wise choice when a single photo is meant to transport the essence of a place, but it is a valid technique for a series of photos where each image represents only one particular aspect or element. In this case, the essence of the place is worked out by putting artistic renditions of its fragments in other contexts. High key or low key: Last but not least I want to offer some thoughts about exposing photos differently, which is more about working with light as an ephemeral thing that than about working with place … or so it seems at first hand. I think we can all agree on the fact that, for most of the natural scenes photographed, there is a certain corridor of what is deemed a “correct” exposure. It does not lose detail on both ends of the spectrum but represents the viewer’s impression of whether it was a rather dark or rather bright scene. There are some trends of how to expose; right now for example rather darkish, moody renditions seem to be fashionable in mainstream of landscape photography. In connection with capturing the essence of a place – or an individual interpretation of it – going beyond the corridor of correctly exposed images can be a valid approach. If a photo is rendered high key, the brighter parts merge into areas of white or almost white and become undefined in the process. The same happens with the darker parts when underexposing a photo. The first strategy is a powerful tool to get rid of a particular display of clouds and light in the sky. Think of my comments in the “land and light” section: It is often the case that a great sky makes a photo more beautiful but adds nothing to a spatial perspective of essence. White out in the sky turns the attention to the land; but it very significantly changes the visual style from a documentary mode to an artistic one, which may interfere with the goal of showing the essence. Again, this technique is subject to very careful considerations. A low-key approach is somehow comparable to a high-key approach. The difference is that the fade to black does not eliminate skylight (when the sky is part of the composition), but rather portions of the land that lies in the shadow. This makes low key more akin to long exposures or a shallow depth of field, as it strongly emphasizes some material elements and discloses others. A very effective use of this approach can be observed in post-sunset forest scenes where only a few brighter things, such as leaves or birch or aspen bark, remain visible. A highly subjective rendering of essential elements of subarctic landscapes: How artistic or how documental a visual approach to a photo, that strives to portray the essence of a place, is, is subject fo personal choice and Interpretation of ideas and thoughts. I hope that the perspective of “essence” that I laid out here is food for your thoughts. As long as you feel motivated to think more about a conceptual design of your photographs I am more than happy. Landscape photography is seeing, thinking, feeling, and creating at the same time!